Embrace joy and live your life to the fullest! From the co-pastor of Lakewood Church and wife of best-selling author Joel Osteen comes a simple plan to help busy women reach their full potential. Learn to manage the pressures of the modern world, understand your awesome responsibilities, make beautiful choices, and achieve true happiness. It’s our heart’s condition that blesses God. In this children’s storybook series, your children will go on an exciting journey set in the medieval world of castles and royalty. When the King of the town is having a party thrown in his honor, the townspeople are busy looking for the fanciest gift they can find to bring him. How you start the day determines what kind of day you're going to have. When you wake up in the morning, it's easy to lie in bed thinking negative thoughts. You don't realize it, but those thoughts can set the tone for a lousy day. This new devotional, from Joel & Victoria Osteen, will help you start each morning right by setting your mind in the right direction and expecting God's goodness and favor. Lay the foundation for a blessed, productive day in the first few minutes of your morning. When you wake up to hope, you'll not only have a better attitude, but you'll see more of God's blessings and favor. Joel Osteen offers practical insight and encouragement for a new beginning with God -- essentials about who He is, who we are, and how with Him we can fulfill our destiny. God loves to give people fresh starts. He wants everyone to see His blessings in new ways so we can reach our full potential and achieve extraordinary levels of success. In Fresh Start, readers learn what it takes to rise to a new level of honor, a new level of influence, and a new level of favor. You have greatness in you. When reading these devotions, be inspired as you reflect on a daily reading, pray a special prayer, and meditate on a thought for the day. Get ready! You can, you will! Joel Osteen reveals the eight essential keys to staying connected with God, so you can be empowered to accomplish all that He has in store for you. This study guide provides thoughtful questions, challenging activities, and encouraging insights to teach you more about God's goodness and let Him be a part of your everyday life. We all desire God's best and the destiny He has for us, but sometimes our words keep us from getting there. Here's an important truth: the words we speak become our reality. When you face challenges, you can bless your future with your words and declare the goodness of God over your life. Declare favor. Declare increase. Prophesy your future. Get ready to see blessings you never dreamed of with this encouraging 3-message USB resource. Get ready to step into a new level of your desitiny with the You Can, You Will Journal. You were created to be successful, to accomplish your goals, to leave your mark on this generation. You have greatness in you placed by God himself. The key is to get it out. Use this journal to write down the blessings of God in your life and thank Him for those everyday. In her new book, Dodie Osteen gives readers a personal account of her extraordinary life and shares what she has learned about love, faith and family. In the revealing memoir, Dodie shares that her path has not always been easy. She gives us an intimate look at her life, from contracting polio as a child to battling cancer and losing her husband, all with her beautiful heart and sense of humor. Join Dodie on her amazing journey of healing, hope and victory! This interactive journal will help you strengthen your self-image and invite opportunity into your life with daily wisdom from The Power of I Am. With this journal, you'll be challenged by thought-provoking questions and empowered to accomplish your dreams. For many, the Christmas season can be filled with distractions and anxiety rather than the joy and peace it is supposed to bring. In The Christmas Spirit, his first holiday book, Joel Osteen offers uplifting and inspiring stories of family and friends celebrating Christmas traditions that will help readers return to the essence of the holiday by practicing the principles taught by our Savior, Jesus Christ, whose birth we celebrate that day. With these stories, Joel reminds us all of what is truly important in life. Filled with humorous and compelling holiday memories from Joel’s family and friends, this heartwarming collection will inspire and amuse readers while enhancing their faith in God’s goodness and eternal wisdom. How do you break out of the ordinary and experience the full potential that God intended for you to live? The answer lies in a simple yet profound process to change the way you think about your life. 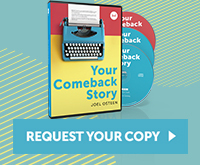 In this special 10th anniversary edition, including a new chapter and foreword, Joel gives steps that will improve your life for good and help you experience victory, joy and satisfaction every day! The words you speak set the course for your future. I Declare encourages readers to speak God's promises over their life daily, one for each day of the month. Affirm God's blessings in every area of your life by declaring faith, hope, and victory over your family, your friends and your future. In this inspiring daily devotional, Choosing Life - One Day at a Time, Dodie Osteen shares her personal spiritual insights - blending Scriptures with godly exhortations and effective prayers - to exhort, comfort, and edify both men and women. Her personal reflections from the Word of God will help bring healing, restoration, and godly encouragement to you and your loved ones so that you can choose an abundant life all year long. In her debut picture book, Victoria Osteen shows children that the greatest treasure of all is a loving heart. Two friends, Jon and Sue, embark on an adventure of imagination that lead them to a grumpy old pirate who has been sailing the high seas in search of the ultimate treasure. With acts of kindness and generosity, Captain Jon and First Mate Sue teach the old pirate that the most valuable treasure is a heart of gold and it can only be found in yourself. Told with a yo-ho-ho and with sing-songy rhymes, this fantasy adventure encourages children to use their imaginations to grow in their faith and inspiration. With joyfulness and exuberance, Victoria Osteen brings her uplifting message to kids in this fun and interactive collection of three books. In Hooray for Today!, Hooray for My Family!, and Hooray for Wonderful Me!, children can celebrate all the blessing in their lives with fun flaps, touch-and-feels, foil and more! In Victoria Osteen's new storybook series, she takes her readers on exhuberant fantasy adventures that encourage children to use their imaginations to grow in their faith and inspiration. In this tale on the high-seas, two friends, "Captain" Jon and his "First Mate" Sue, embark on an adventure of imaganation and discovery. While exploring the world on their imaginary ship, they meet a grumpy old pirate who is looking for the ultimate treasure. Told with a yo-ho-ho and with sing-songy rhymes, these two adventurous friends teach the old pirate that the best treasure of all is the love in our hearts. A fun activity and crafts page at the end of the book encourages kids to implement the lesson they've just learned and to the adventure in their own daily lives.